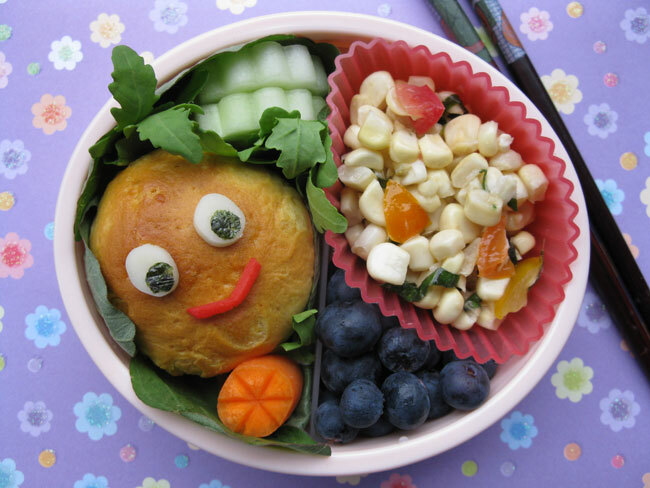 This mini bento was inspired by some recent bentos created by Susan Yuen of Hawai'i's Bento Box. She uses biscuit dough to create little bento creatures and cute little faces. Inside, she hides bits of yummy filling. I decided it would be a fun and quick way to make a bit of bento stash: ingredients that you can keep in the freezer and just pop into a bento for quick assembly. Plus, I thought it might be a good way to use this new spice blend I got at the Santa Rosa Original Certified Farmers Market. In this bento: a "muffin man" biscuit filled with Fra'mani Rosemary ham and Duqqah spice blend from The Handmade Pantry (face details are provolone cheese, nori, and beni shoga pickled red ginger), some arugula and green amaranth leaves, a few slices of cucumber, a baby carrot, blueberries, and some leftover fresh corn salad. 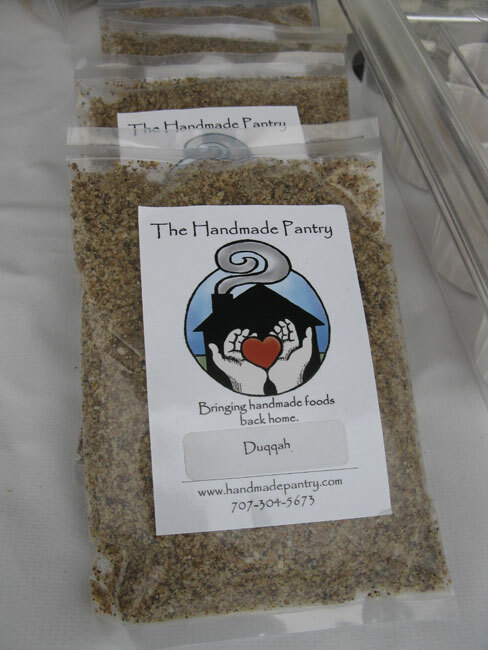 Duqqah (also spelled Dukkah, or Duqqa) is an Egyptian condiment served with bread. You dip a slice of bread in olive oil, then in the Duqqah. Ingredients vary, but the main parts of Duqqah are sesame seeds, coriander, cumin, salt, and pepper. Other nuts are often used, and some versions include hotter spices. Jane from The Handmade Pantry says you can use it with fresh veggies and olive oil, try it as a rub for grilled meats, in soups, and salads. Combined with the buttery biscuit dough and fragrant ham, I think this turned out really good as a bento ingredient! You can find The Handmade Pantry at the Wednesday Santa Rosa Original Certified Farmers Market. On a side note: using the right tool is essential for quick and safe bento making. I tried to avoid using one of my smaller, sharper paring knives for the detail on the carrot, because I didn't want to get another knife dirty. Well, the bigger, more awkward knife slipped in my hand, and whoops, I got a little boo boo. 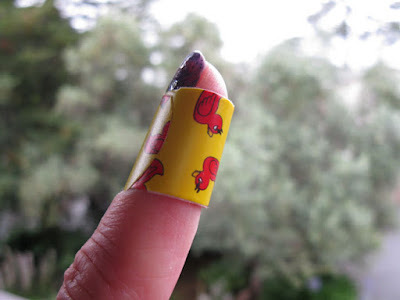 Luckily it was not a deep cut and I had these devil duckie bandages on hand to make it all better. I have included this bento in Shannon's What's For Lunch Wednesday Blog, a great way to see what other bento bloggers are up to, and to share ideas. Thanks so much for the mention! :) I love your muffin man he is too cute!!! Very beautiful bento. Oh wow, another yummy bento--love your inventive and fresh flavor combos and your cute take here on Susan's sweet biscuit bentos!! Thanks bentobird! I may try some different stuff with this spice blend, it is really delicious, and prepared locally without preservatives.